Readers demand information and orientation in real time and not only on the following publication day of the corresponding media. This effects not only news, but also advertising. For the latter, this could be opening hours, whether venues and premises are actually open at the specific time of reading the ad, how far the reader is distant from the location and in which way he could get to the advertised location. Readers do expect to be addressed at eyes level. Communication will be bidirectional and is not further governed by anchor persons of publishing groups. Readers may want actively to contribute to the media, each reader may be also a potential content producer. This sociocultural change in the expectation towards media necessarily implies massive changes in the content management and delivery techniques of publishers, in editorial tasks and organization. The digital back channel from the reader to the editorial staff rsp. the publisher gains decisive importance. Usage and importance of mobile devices for news media, especially for younger readers, is evermore increasing. In this age group, the smartphone has become the exclusive device for receiving and reading news. In consequence, digital media transformation does include much more then digitizing analog contents, products and processes. It should also materialize answers to the mentioned changes and trends. With our solution construction kit featuring modules, which may be applied on their own or in a combined way (see below), we have developed a systematic concept for a fast and efficient track into the digital future for a publishing house, which we want to design together with your organization. More details on this construction kit system you will find on our corresponding special page. With our blueprint of the news network between and for citizens featuring an integrated reading and reporting app , we have combined all modules of the construction kit system into an ideal-typical new regional/local media, in order to verify the system and its profitability. Again, more detailed information about the news network are presented on our associated special page. 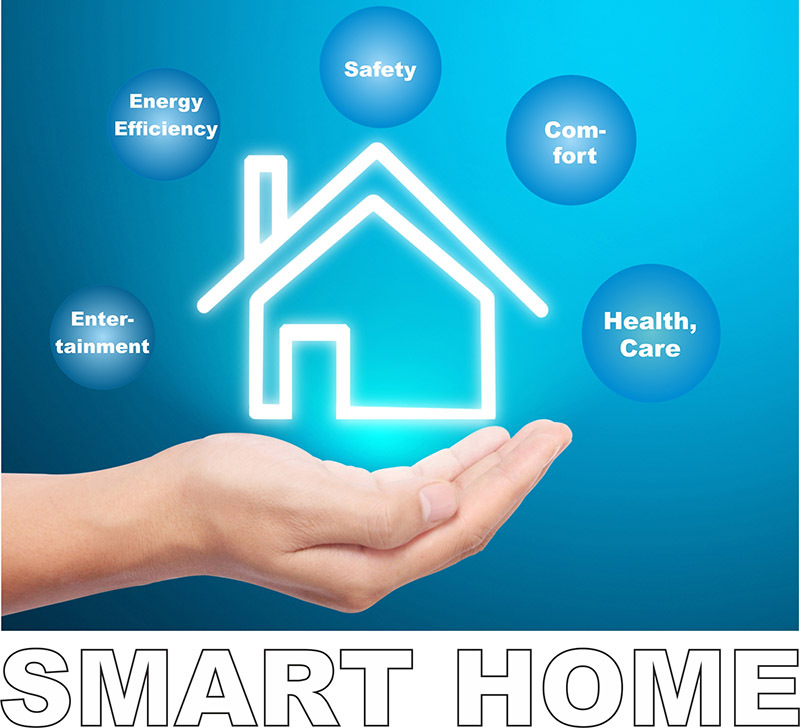 Smart home denotes a mega trend, where cross-linked intelligent sensors and actuators actively control the energy efficiency of a household as well as security, comfort and entertainment for the inhabitants. Supporting health and wellbeing especially for elderly rsp. persons requiring nursing care in a household also gains importance as an additional segment of the smart home. The central issue of active assisted living (AAL) is to support a self-determined and safe living of such persons in their familiar home by technical means until the high age - as long as this can be justified from a medical perspective. Special relevance is given to this topic by the fact that in 2015 ( data source: German Federal Office for Statistics ) alreday more than 1.38 million persons in need of care in Germany ( out of 2.86 million in total ) are nursed exclusively by family members at home. This is nearly half ( 48.6% ) of all persons requiring care. In total, 2.08 million persons, corresponding 72.6% of all persons in need of care, are nursed at home by relatives and/or mobile services. Following data of the Deutsche Alzheimer Society, annualy about 317,000 new cases of dementia have to be registered in Germany, with an increase rate of 40,000 persons per year and ( data for 2016 ) more then 1.6 million patients in total suffering from dementia at age 65 or more. These person typically continue to live at home in the early phases of their illness. Here, assistance systems can effectively support care-giving family member and mobile nursing services in their responsible and demanding task. You find more details on this topic on our special page. We are actively working on the development of this future-oriented business segment of assistance systems, as well on the technical concept as on suitable business models. With the new innovative smartwatches, mobile computers worn on your wrist, the service scope of stationary assistance systems will be effectively increased and expanded to activities on the go. 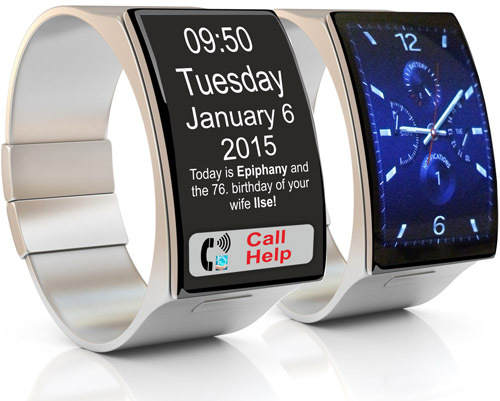 In our smartwatch assistant for the elderly, a simple artificial neuronal net (ANN) - adapted to the computational power of the watch - implements a performant recognition of the events and activities of daily living (EDLs, ADLs): falls, liquid ingestion (drinking), … .